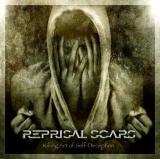 Reprisal Scars has been churning on a steady diet of demo tapes in the Finnish underground since fall 2003 and now, five years later, out comes their debut album, Killing Art of Self-Deception. Reprisal Scars represents a kind of rougher side of the melodeath-field in that it sprinkles melodies and very occasional clean vocals here and there, but grunting and balls-out-heavy, none-too-fancy-riffage is what they’re built on. For some comparisons, I guess I’m reminded of Amon Amarth (especially the vocals) sans any of the mythological imagery, Viking or otherwise. Like mentioned, this album goes for the prize with meat and potatoes, no nonsense-metal approach. The guitar work bludgeons with riffs and go for the harmonized melodies and solos evert here and there. The opening title track starts it up with a fast pace that spices it up nicely with a slow build before the grooving verses. Sure stuff to get a pit going. Blinded Eyes and Color Of Violence are the somewhat In Flamesy-songs in here (think maybe Whoracle), with the latter being one of my favourites with the catchy riffs. The Note and Grand Assertion Of Hate are not exactly Panteraish, but evoke that spirit with the grooves. The album’s instrumental, Echoes In Silence, is a 90-second ditty that falls into the pit of instrumentals that seemingly have no purpose and fall in the middle of things. Done Is Done closes album with a great shout-along chorus and some subtle keyboards. The band plays tightly and the only thing that I felt needs lots of training are the clean vocals. It might also just be that because I’ve been on a huge prog-binge lately, that the drumming seemed a bit unspectacular and dull at points, but for those not looking for anything wanky, it is not an issue. The production accommodates the gritty and harsh vibes of the music. It is also well-balanced and crunchy, although I would have personally wanted more bass in the mix. For those looking for some down to earth, riff-heavy metal without too many frills and ornaments, Reprisal Scars is definitely worth checking out.